“Size matters not. Look at me.” Bundle your child with this toddler Yoda costume. The costume’s robe and headpiece are made of polyester/flannel material. The robe includes a hood, which has pieces of Velcro along the front and an attached brown shirt underneath that zippers open and closed. In addition, the headpiece snaps together under the chin. 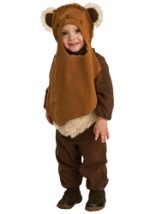 Your child won’t be able to help how adorable they will look in this Yoda costume.